There are twenty species of armadillos living in Latin America, but only one is native here in North America. The nine-banded armadillo is a mammal who is most recognized for its armored shell, which covers its back, head, legs, and tail. And while it may seem bald, the armadillo does have hair on its sides and belly, which it uses to feel its way around in the dark. Because armadillos have little body fat and thin shells, they are unable to retain their internal temperatures the way most mammals can. This causes them to change their behavior depending on the weather. In the warmer months, armadillos are typically more nocturnal and will begin foraging for food at night when the temperature cools down. However, in the colder months, armadillos can also be more diurnal, searching for food earlier in the daytime when it’s warmer out. This change in behavior can sometimes make it difficult to trap an armadillo who’s been destroying your yard. Armadillos use their strong legs and large front claws to tear into the soil in search of ants, termites, beetles and other insects to eat. These unsightly holes, among other things, are what make armadillos a common household pest. Armadillos also cause issues for homeowners by eating their plants and fruit, and creating huge tunnels in the yard, which can actually cause structural damage to your porch, sidewalk, foundation, and fence. 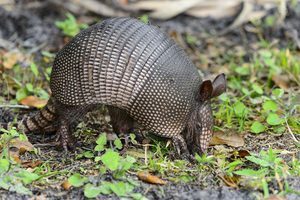 These structural damages can cost you thousands of dollars in repairs, which is why you should call Critter Control® of Orlando if you’ve noticed any signs of armadillos on your property. Due to their protective armor, lethal traps are usually an ineffective way to capture the animal. And, because armadillos dig for their food, you can’t entice them to eat bait or poison. In fact, leaving out bait to attract the armadillo will usually cause other wildlife like raccoons or opossums to come onto your property. At Critter Control® of Orlando, our experienced technicians understand the importance of carrying out proper trapping techniques to effectively remove the armadillo from your property. We will also do a home inspection to see how they are getting into your yard and what may be attracting them, so that we can address the real root of the problem. Even if an armadillo is trapped, others will keep coming on to your property until you take care of your wildlife issue in its entirety. For more information, or if you have any questions, contact us today by calling 407-295-7194. We’ll be happy to give you a free estimate and help you get rid of your armadillo issues for good.